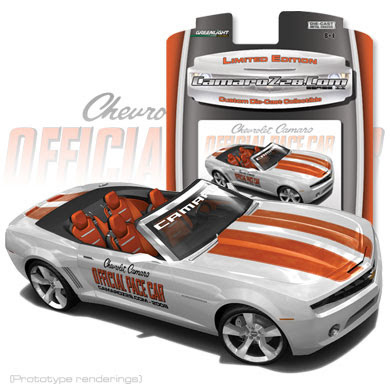 Greenlight Camaro Convertibles coming soon! I have already pre-ordered my copy, take a look at their site and order yours today, supplies are limited and going quick! * Officially Licensed by GM! 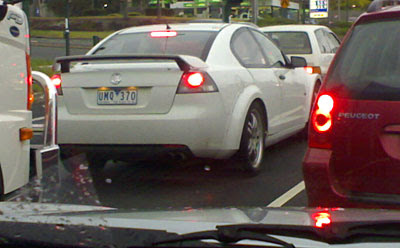 An Australia native spotted this VE Commodore-come-Monaro in traffic on a Melbourne street not too long ago and submitted it to wheelsmag.com.au. 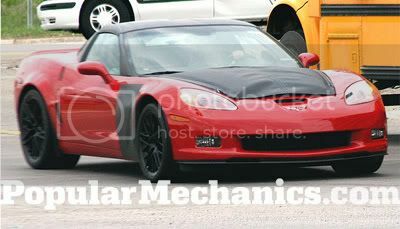 Looking at the picture below (originally posted by Loggins on digitalcorvettes.com) it shows the clear section in the hood that we've specualted about covered in camo tape from the outside. 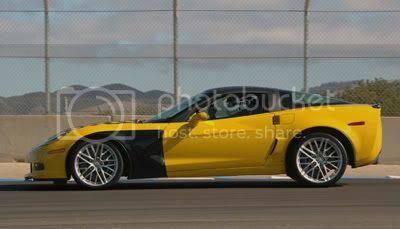 Was this a Corvette ZR1 at Laguna Seca this past week? 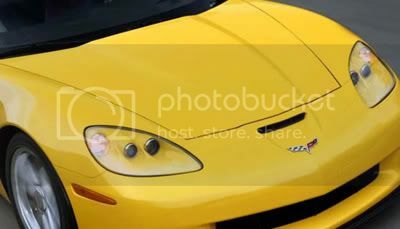 Take a close look at the two pictures below, the hood seems to be the same used on the current C6 Corvette, no sign of a hood bulge. Is GM toying with the media? 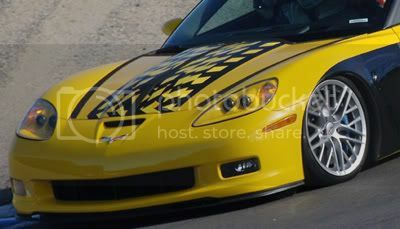 Corvette ZR1 at Laguna Seca? Check out this TRANSFORMERS DVD movie gift pack on ebay this week. Click HERE to see the items on ebay! GM posts picture of Camaro in Camo! 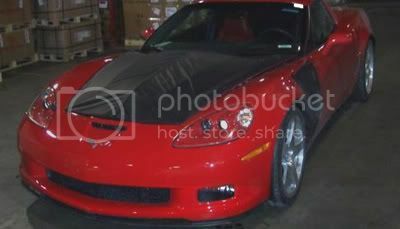 Fastlane.GMblogs.com posted a picture of Ed Welburn hugging a Camaro recently. There are a few other minor things you can make out in this picture, what do you see? 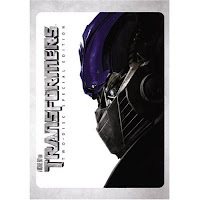 Today is the day, you can buy the Transformers DVD in a number of special edition packages. Available in one or two dic sets, Widescreen and HD format, there is plenty to choose from. Sorry Blu-Ray customers, that version is not available at this time. To purchase a copy today from Amazon - see the link on the right side of the page! See the list below for the stores and what special editions or freebies they have. - Buy the movie and the Target Exclusive "Evolution of a Hero" Collectible Bumblebee Set and receive a $5 gift card. This week there is a 1994 Chevy Camaro Z28 on ebay. 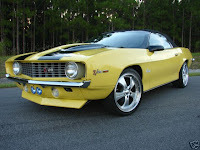 The company selling it has created a unique 1969 Camaro body kit and has posted their prototype on ebay. While this car was not built using a kit, it was hand built using steel panels. We are not sure if future models will be using a kit but they will be based on lower mileage CF4 Fourth generation Camaro chassis. Not much. At least not publicly. Projects like the GM Volt and E85 cars and trucks are there, but what about gas/electric hybrids? Nada. And the maddening part is, GM has the stuff to make it happen. What if GM came out with an iconic American nameplate (as in, a sports car brand) that had muscle and great gas mileage? Like matching a new hybrid system with GM's V8 Camaro (a Chevy product)? That could happen...but it's not. Why not? GM has the Volt coming about the same time as the Camaro Convertible hits showrooms all over the world. Personally, I see hybrid sports cars in the form of a Saturn Sky or a Pontiac Solstice, those are much better suited then the heavier Camaro/Zeta platform. Chevy brought out its large array of Corvettes but the main attraction lay with the brand new Camaro, which is intended for release in 2009. The convertible version of the Camaro was on display, showcasing the realm of possibilities the company is exploring within the next year. The final design is not set for the convertible version, but representatives at the show confirmed that the body style is set in stone, if not for a few tweaks that will be made to meet safety regulations.